Rabies is a fatal viral infection that is transmitted primarily through bite wounds. Skunks, bats, raccoons, and foxes are the primary carriers. 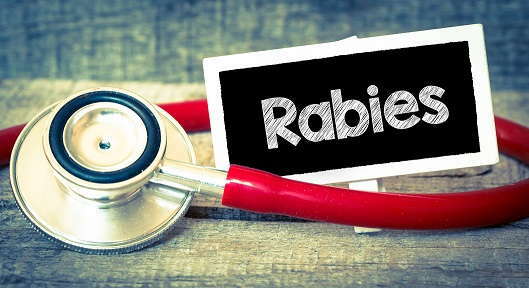 Rabies is also fatal to humans, there has been only one case of a person surviving rabies when treatment was started after clinical signs were present. Puppies are vaccinated when three to four months of age and then one year later. Each state varies in its rabies law, most states require rabies vaccine every three years for adult pets, but some states still require them annually. If a person or a pet is bitten by an unknown or unvaccinated animal (dog, cat, or wild animal), the local health department or your veterinarian should be consulted. The animal that bit should be apprehended, if possible, and your veterinarian or local health official should be contacted immediately. A test can be done to see if rabies is present, but it does require the animal be euthanized because the test can be done only on the brain. Rabies is preventable through regular vaccination of dogs and cats. Ask about our weekly specials!